LONOKE, Ark. – Worries over growing bollworm populations are amplified by possible resistance to dual gene technology. The flights have been merciless this growing season, without much of a break. Although only certain areas of Arkansas are currently affected, that could change. Lorenz’s biggest concern with this year’s bollworm pressure is the resistance to dual gene cotton recent data has shown. Dual gene technology refers to cotton varieties that have two Bt genes, which are used to protect against multiple insect pests, including bollworm. Lorenz is alerting growers that not controlling these tremendous bollworm populations in cotton will be detrimental to the success of their crop. When Bt genes are failing to control bollworm populations, an egg threshold of 25 percent is generally used, meaning producers should treat when 25 percent of plants have eggs in terminals or bloom tags. However, some Arkansas cotton fields are seeing numbers well beyond that. “We’re not just seeing 25 percent or 40 percent, we’re talking about multiple eggs per plant,” he said. “Growers are going to see resulting damage and how they manage this is going to make a difference. As far as management practices go, many Arkansas cotton producers have already taken control measures, but they’re getting hit again. “There are a lot of concerned growers that made an application seven to ten days ago of a diamide, like Prevathon or Besiege, to get the bollworms under control, but now there’s a new flight,” Lorenz said. Although there is a growing concern for the damage these pests can cause, Lorenz warns against going overboard with treatment applications. There are more control options that will allow cotton producers to avoid making a second diamide application too soon. 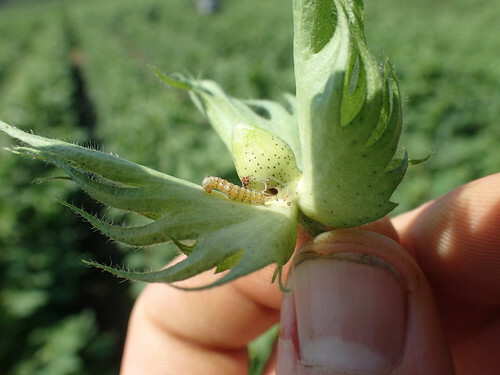 Arkansas cotton producers are at risk with these current bollworm numbers, and Lorenz is warning everyone to scout their fields. For more information on insect pest management, download MP144 “Insecticide Recommendations for Arkansas,” at https://www.uaex.edu/publications/pdf/mp144/mp144.pdf. Mention of commercial names do not imply endorsement by the University of Arkansas System Division of Agriculture.